Metal-Tech Partners is dedicated to providing you with the exact equipment you need. To accomplish this goal, we utilize an innovative manufacturing process that allows us to offer you precision-tolerant, premium-quality products at competitive prices. We also maintain a full inventory so that your standard-item orders are available for immediate delivery. 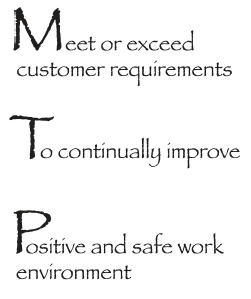 In addition, MTP strives to provide you with the highest level of customer service. AT MTP, exceeding your every expectation is our goal. Our Quality Policy insures that we give you exactly what you want, when you want it, and at the most competitive price in the industry.